I completely appreciate why the internet is buzzing about Governor Romney’s claim during Tuesday’s presidential debate that he had “binders full of women.” But there’s also a part of me that identifies with his statement. I, after all, have file cabinets full of men. While Romney said he used the binders to identify qualified candidates for key positions in state government, my file cabinets serve an entirely different purpose. I use them to store reminders of all the men that are NOT qualified to be in any part of my life. I started my first file when I was a young girl and a boy told me that men were more important than women because they got to keep their last names when they got married. I was devastated, but I was also angry. 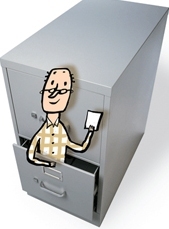 As a result, that boy had the honor of being the first male I ever put in a file cabinet. * The minister who insisted my friend keep the word “obey” in her wedding vows. * The agency director who tried to prevent me from getting a management position because I breastfed my baby during a meeting that I graciously attended while on maternity leave. * The community leader who always referred to me by using my husband’s last name, even though he knew I had never changed mine. * The supervisor who blatantly promoted young, attractive females over more qualified, middle-aged women. I’ve recently been considering adding another man to my file cabinets. While this man claims to support women, he’s never demonstrated any real understanding of the often life-long battle many of us have faced. He’s skirted around the issues of equal pay for equal work and reproductive rights. And even when he tries to express his appreciation about the need for equality in the workplace, he falls short by indicating that women don’t want to work long hours because they have to go home and fix dinner. Yes, this week I’m definitely thinking about adding that man to my file cabinets. I’m just not sure if his binders will fit too. Posted on October 20, 2012, in current affairs, My life, News, perspective, Politics and tagged binders full of women, equality, Mitt Romney, musings, news, opnion, politics, relationships, sexism, Thoughts. Bookmark the permalink. 9 Comments. Very timely – I’m sure there are lots of women who have files stuffed with men – now is the time to talk about them!!!! Thanks for expressing so much for so many!!!!! Reblogged this on T.R&B SHOCKLEY'S. Okay, too funny but oh so true. I have many men and a few women that I can place in a binder. I just found your blog and have a feeling I will enjoy following it. Thanks so much! What has surprised me are the number of people who have asked “why are women being targeted?” Ummm… step into my shoes… and I have it really, really good! Guess there are alot of rocks that people haven’t crawled out from yet! How about the church I attended for over a year post-divorce before I was finally spoken to by the minister who by then had discovered “who” I used to be married to, and then proceeded to ask me many questions about my ex……and not one question about me. Into the file cabinet he goes. Yes… he definitely belongs in the file cabinet.